The debate between proponents of rational thought and defenders of "intelligent design" has been getting more furious in recent years. Is it even possible for all these arguments to be stated clearly and fully so that the magnitude of what is at stake could be fully established? Religion is viewed as a foundation of morality, which means that an alternative should be proposed. Is there a code of life for proponents of rational thought who want to be kind, contributing members of society that would not interfere with the believer's right to freedom of expression and to his own beliefs? 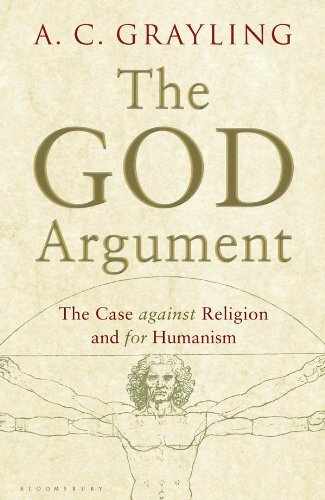 In The God Argument, Anthony Grayling calmly tackles such questions and offers a thorough examination of the arguments as well as the associated considerations. He does so with full awareness of the reasons that people flock to religion and the needs satisfied by such. The author also explores the humanist outlook that is recommended to be the "ethics code" that would guide the actions of a non-believer. The solutions proposed in the book carry great weight because all sides, all issues and all facets are taken into account. Choosing to subscribe to this topic will automatically register you for email notifications for comments and updates on this thread. Email notifications will be sent out daily by default unless specified otherwise on your account which you can edit by going to your userpage here and clicking on the subscriptions tab. Writing this book must have been a humongous undertaking. I bet it's a good psychological read! I'm really interested in reading what Graylings considers to be the ethics code for humans. Morality is highly individual, but unfortunately ethics can't be. So would I be, I find it fascinating what other people think other people think is right. I tend to think more on what I think is right but feel society does a good job controlling that for people as long as they pay attention to what is socially acceptable. I do try to consider the feelings of people I interact with but I often disagree with what they feel is the right way to feel about things. due to individuality believe in the golden rule being treat others as they want to be treated if you are to expect them to treat you how you would like to be treated. However many people don't put out the way they would like to be treated and knowing what I know of people this can often be a good thing. I really could go on long enough on this subject to write a book about it so I will stop here for now. Sammy's right, we all have a different code of ethics due mainly to our upbringing and that's something that has to be changed for all of us to get along on this planet. Hmm, I think social networking is helping to better round off peoples moral compass if you will. As people gain more exposure to prospective but there will always be an individual aspect where people feel more strongly about certain things than others. with such feelings people will always feel different about what is right and wrong. So I would say our code of ethics must evolve closer to enable us to get along better on this planet, but I find it unlikely we will ever all share the same code. Social networking definitely is making the world a much smaller place. We can now talk to people and learn about them in just a few clicks, while just a few decades ago, we didn't even know what the Middle East was like except for the lies on the nightly news. I haven't heard of this one yet! It sounds like something that can keep all of us here talking for months!